Vacation rental cottage. Sleeps 4, 1 bedroom, 1 bathroom. No pets allowed. Best Place cottage pictured from the circular driveway. View of Shipyard Cove and Brown Island from property. 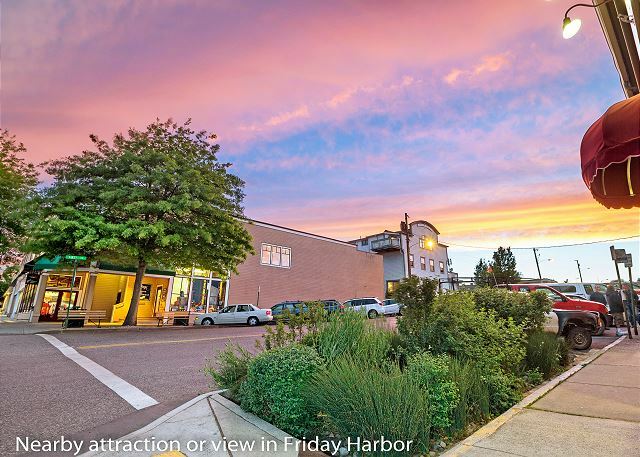 A place to sit and enjoy the sights and sounds of Shipyard Cove. Looking back at the cottage from Shipyard Cove. Living room is furnished with a sleeper sofa and has a electric fireplace insert. 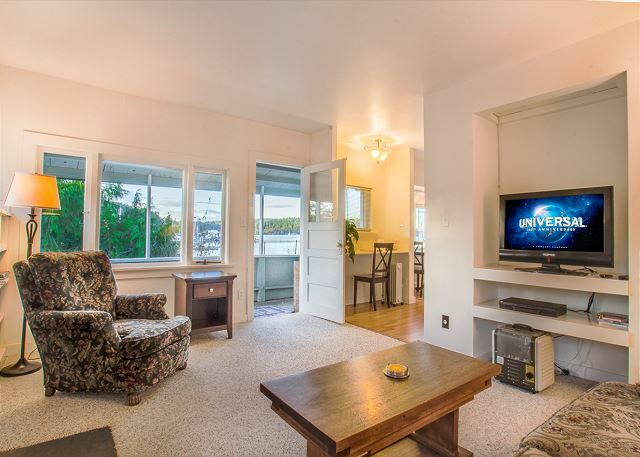 Enjoy the flat screen TV with cable service or just stare out at the bay. 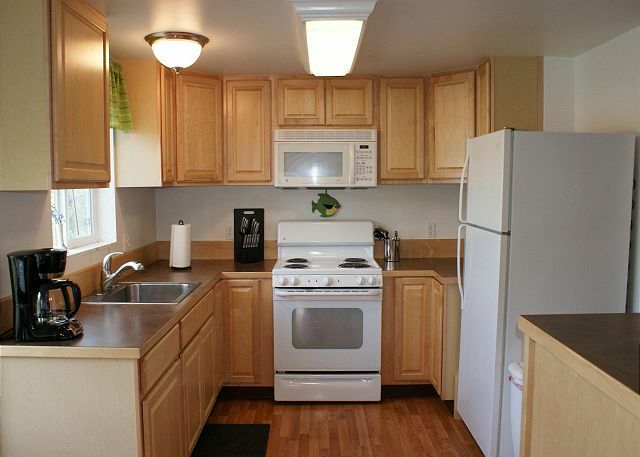 Kitchen is fully equipped with everything you need to cook a meal as well as a view of the bay. Interior dining table and kitchen both have water views. 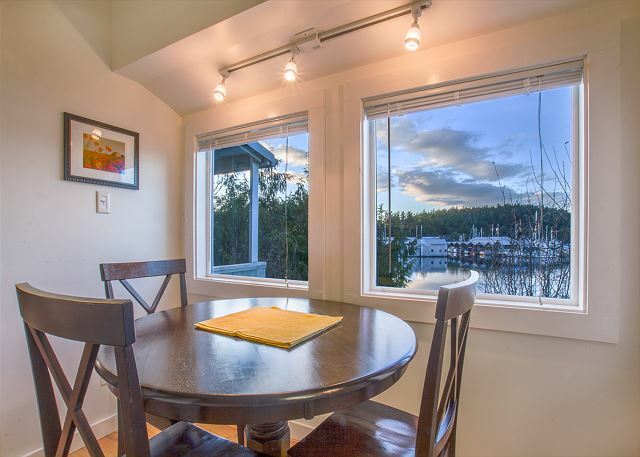 Interior dining table with views of Shipyard Cove. Living room is furnished with a sleeper sofa, a cozy electric stove insert, and has a flat screen TV with cable. Bedroom is furnished with a queen sized bed. 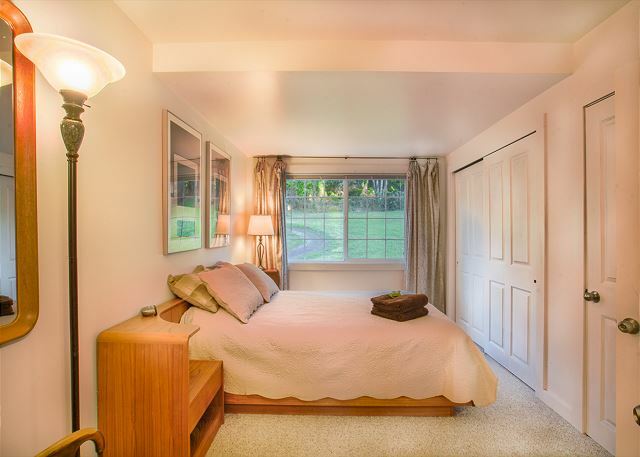 Master bedroom has a walk through bathroom attached. View of Shipyard Cove from porch seating area. WATERFRONT! Best Place Cottage is a cozy, comfortable and historic piece of the island. 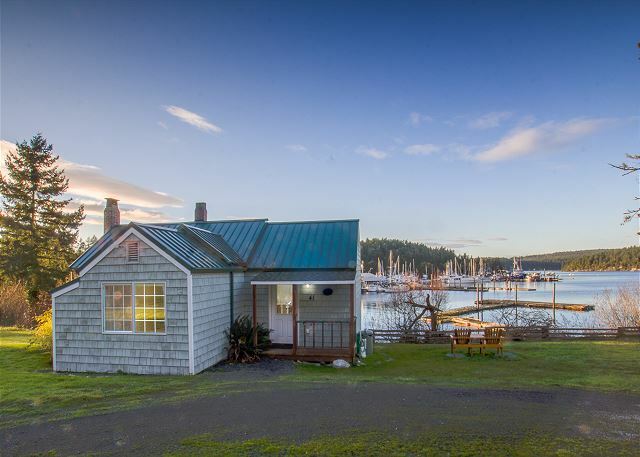 Perched above Jensen's Shipyard and Shipyard Cove Marina, the cottage is nicely updated and offers a great vantage point for boating activity. This is a perfect property for couples or small families. 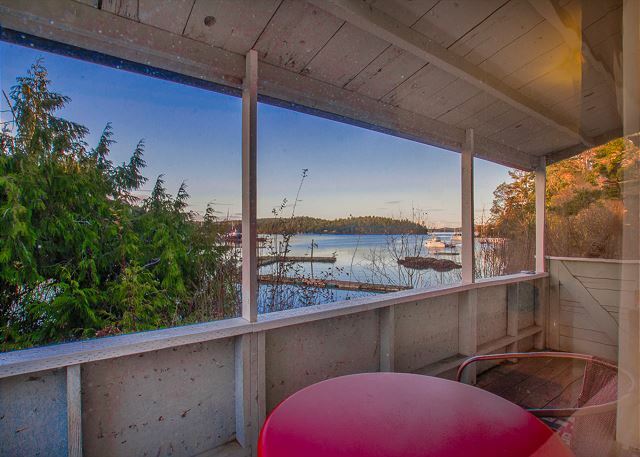 Located minutes from town, this waterfront property offers great views from the living room, eating nook, and kitchen. 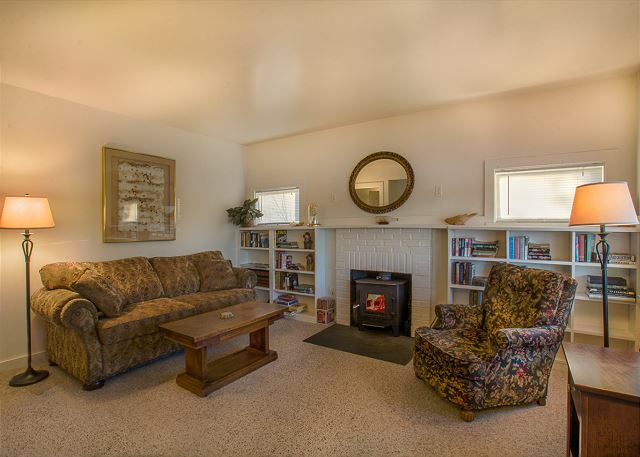 The living room offers an electric fireplace insert and is furnished with a sofa sleeper. The bedroom is nicely appointed with a queen size bed. 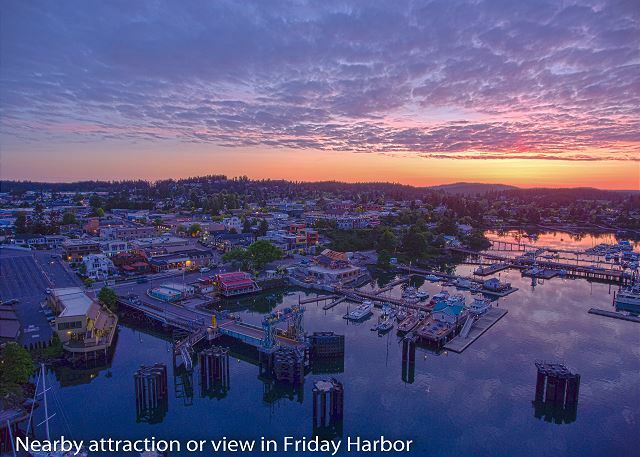 Although there is no dock access from this property, the Shipyard Cove Marina does offer transient mooring, making this a great spot for boaters to regain their land legs! *There is NO dock access from this home. ** Parents please be aware that this home has high-bank waterfront. Although the owners welcome families, the home may not be suitable for all children. This house does not have Internet access and has basic cable. 3 night stay August 2018...our only complaint was that it did not include access to water, and was bigger. CHARMING! Oh...lots of wasps and bees! 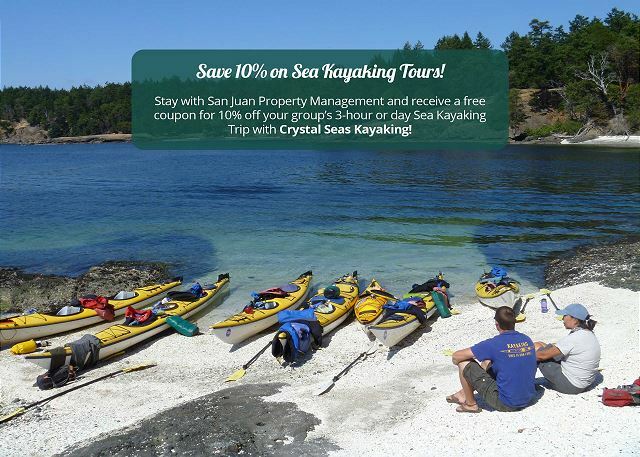 Perfect place to stay while in the San Juan Islands. We could walk or take a short cab ride back and forth to town. We loved watching the harbor with our coffee in the morning, and again with a cocktail in the evening.The bed was very comfortable. The cottage is very cute and the location is great. 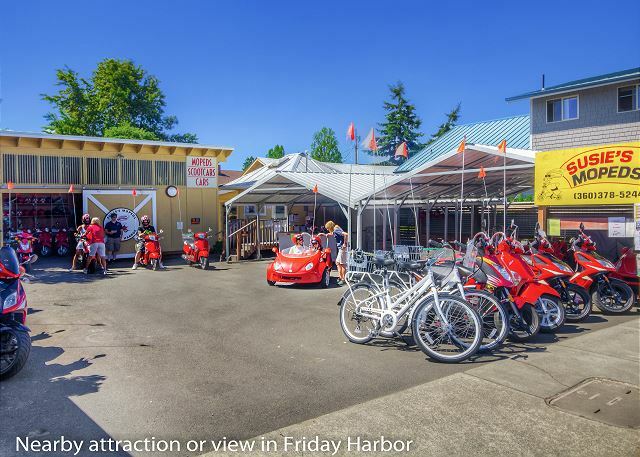 It's on the water so you can sit inside or out (covered patio) and see a beautiful sunset and watch the harbor seals, sea otters and a pair of great blue herons as well as kingfishers. It's also nice and quiet and dark enough so that the stars were amazing. Having laundry is nice and there was detergent there. Small bars of soap were provided but there was no shampoo. In the kitchen there was salt and pepper, cooking oil and some spices. No plastic wrap or plastic bags which would have been helpful. 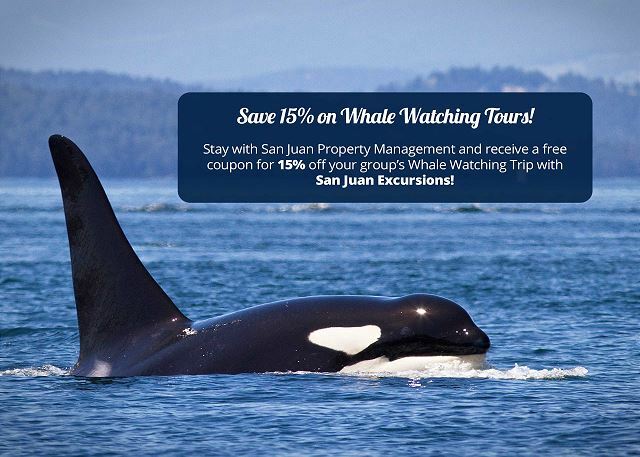 We did the whale watching tour that was discounted with the stay. We didn't see any whales and learned later that the companies with smaller boats see whales more often since they can more easily go to where the whales have been spotted. It was still a good trip with very knowledgeable naturalists on board. We also did the sunset kayak trip which was wonderful. We had such a lovely time. The cottage was well equipped, very clean and the perfect place for us. The cottage is quaint, very enjoyable for two people. The beds and pillows were wonderful. The picturesque kitchen window was wonderful for morning coffee, the deck very nice for a glass of wine. 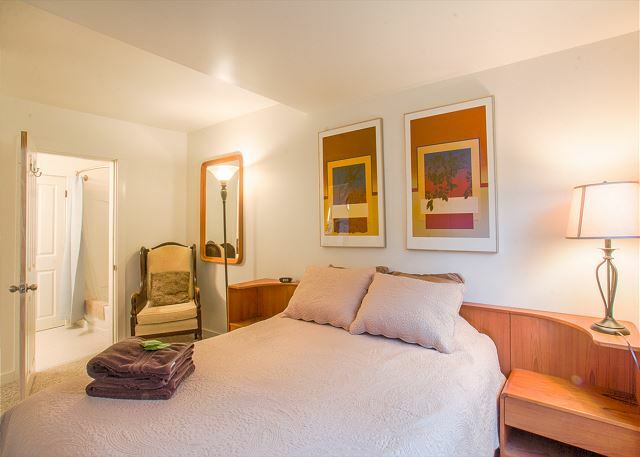 The cottage provided just about anything that you would need for a comfortable stay. Hopefully a much needed coat of paint can be applied to the deck, a few windows washed and not such a caustic smell of Pinesall from cleaning. Otherwise, a great place! Only a few minutes from the city center, we thoroughly enjoyed being close enough to grab a coffee, yet far enough to enjoy the peace and quiet. It was perfect for an extended weekend get-away. One downside was that the bed was extremely soft. We enjoyed 4 wonderful days in this beautifully decorated cottage situated in a great location not far from town!! 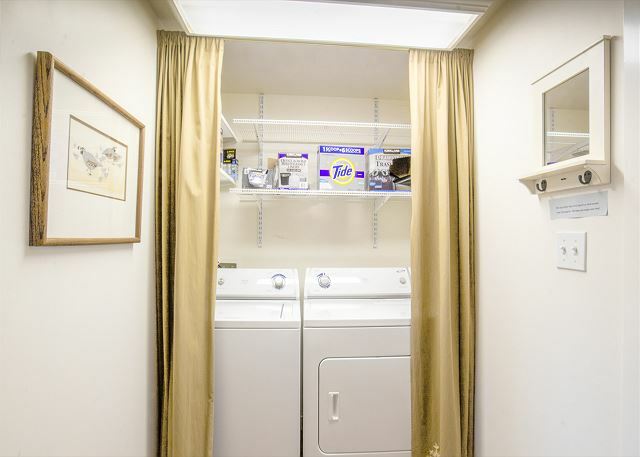 All convenient amenities were included. We were fortunate to have visits from a deer, Popeye the seal and her pup, and spotted a bald eagle amongst the pretty trees!! And we relaxed well on the balcony watching the ferries and boats go by! This place is well recommended! And communication with San Juan rental was great! We’d love to return!! Wonderful, quiet, wildlife, easy to get to, a perfect place to stay ! Great stay again. This was our third stay at Best Place Cottage. There was only two nights available between longer staying guests before and after us, which was just what we needed. Thank you for accomadating our busy schedule. We loved this little place. It was everything we hoped for. The most relaxing experience. Deer showed up every evening, the Seal's bathed on the pier. Close ride to the little town. I would have liked the shrubs cut down a little to enjoy the view more. The furniture and bed very old and needs to be updated. But, everything else was nice and clean. I will definitely go back for the peace and quiet. Can't wait!! This was our favorite spot on the island. We spent a lot of time sitting in those Adirondack chairs watching the seals,water birds,deer with a glass of wine and fresh seafood cooked on the grill. The cottage was adorable and comfy but the outdoor surroundings can't be beat. Would choose this place again and again. Wish I could live there! I planned a 4-day getaway for my husband and me without telling him where we were going, and reserved this lovely cottage for our stay. It was exactly what I wanted - secluded and close to the water but close enough to Friday Harbor that we didn't need a car. It was a nice 25-minute walk into town each morning, and the same in reverse each evening, but we do a lot of walking anyway and the calorie burn justified some extra ice cream and beer. Lots of seals frolicking in the marina, a few herons as well, and deer would feed in the side yard each evening. Slightly discomfited by the bird's nest above the back porch light - it resulted in poo on on the porch and we felt bad that the parents were hesitant to feed the chicks if we were sitting out there, but they got used to us and we reached a mutual agreement. And it was pretty cool to watch them feed the chicks - rather Disneyesque. And beautiful sunsets. And wonderful foggy mornings. Very picturesque. This cottage was perfect for my friend and I. Great size, very comfortable and had everything we needed. Within 20 minutes of our arrival on Saturday evening, we were greeted by the local seals, otters, and deer. What an amazing welcoming committee! The views from the cottage were great. Sunrises and sunsets, watching the boats and the wildlife was peaceful and relaxing. Highly recommend and hope to be able to visit again! The property management company checked in with us the day after we arrived to make sure everything was good, which I really appreciated! 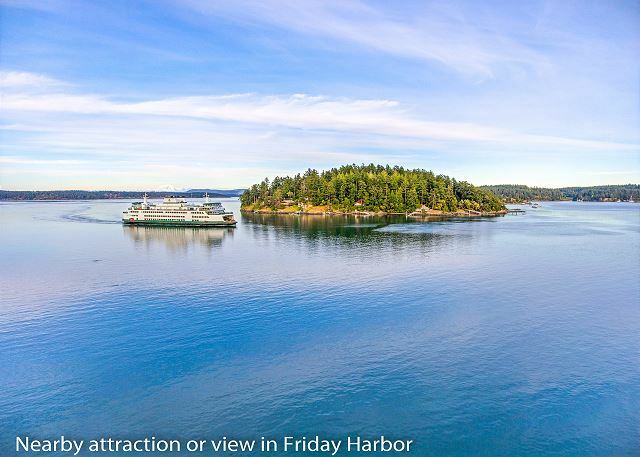 Perfect location, right next to Friday Harbor. We brought our stand up paddle boards (SUP) and went from the neighboring boat docks over to Friday Harbor for dinner and then SUP'd back to the cabin after dinner. It was so much fun. 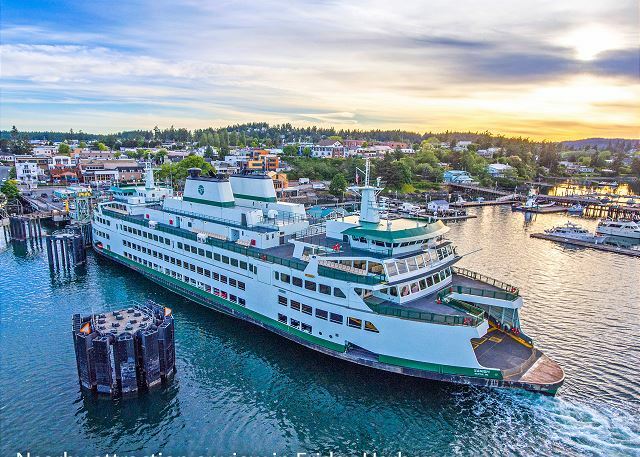 It was only minutes away from Friday Harbor by car. We spent our afternoons exploring the island and SUPing around different parts of the island, and spent our mornings and evenings enjoying this adorable little cabin. The cottage is clean, cozy, comfy and has what we needed to enjoy the weekend. We ate out at nearby restaurants and also bought food to make our own breakfasts and dinners in the kitchen at the cottage. It truly has a beach house feel and is only feet from the water which offers beautiful views. The house is also off of the main road, which you have to take a gravel road down into, so this provided a sense of calm and privacy. Beautiful setting! It was so darling and perfect. I was tickled pink with the size and layout of the cottage. The amenities, the peacefulness, the wildlife was exceptional! I want to live there! This place was wonderful! Couldn't ask for more! We were looking for a relaxing environment and that is what we got! Location, Location, Location! When we drove up to the cottage, we immediately loved how quaint it was, and the view was spectacular. This was the first time my husband and I have gotten away, by ourselves, in years. We loved the coziness of the cottage, the peace and quiet and the fact that it was so close to town. Would definitely like to come back to this place. We enjoyed our stay. 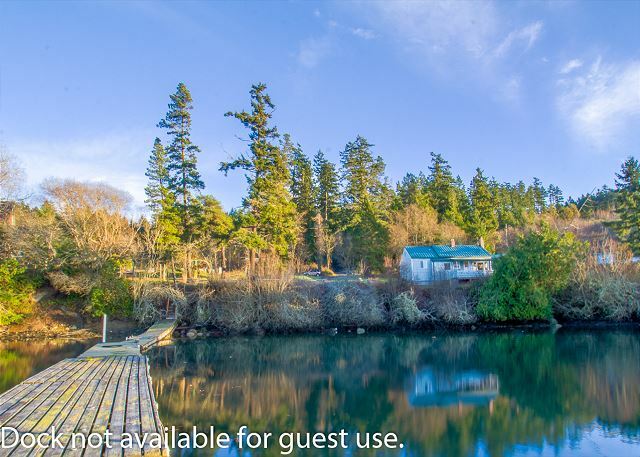 Best Place cottage is a perfect quiet location very close to Friday Harbor. Beautiful view of the Marina with Harbor seals on the neighbors dock every morning. My husband and I stayed the week in this fantastic cottage! Everything was great. Perfect spot. Only ten minutes from town, by bike. We saw seals every evening on the dock and black tailed deer as well visited every evening. Lots of different birds. We will certainly stay here again when we visit. The only thing I would change is maybe trimming some of the bushes behind the cottage so you can see the cove a little better. Absolutely wonderful little cottage and very convenient to town! To sum it up: we'd stay at Best Place Cottage again in a heartbeat. The cottage was very close to town, but far enough away that it was incredibly peaceful. It was absolutely silent at night, and in the evenings and mornings we were entertained by the harbor seals and the birds. Others have complained about the soft bed...the bed has a memory foam topper on it, and we found it VERY comfortable. We really felt at home and couldn't have asked for anything more. The cottage was a wonderful place to stay, it was clean and well stocked. We had our two adult daughters stay with us and I was very pleased the bathroom had an entrance from the main hall along with the bedroom access. The mattress was a bit soft for my back. The property was perfect. There were deer that walked right in front of us, there were otters, birds of all types, a bird watchers paradise. Then there were the entertaining seals. I couldn't wait to come back to the cottage to see them every day. This place is a blessing that I am so happy I got to experience. This was exactly what I was looking for in a stay on San Juan island. Everything was perfect. The little cottage was comfortable and well stocked w all the things that we needed. 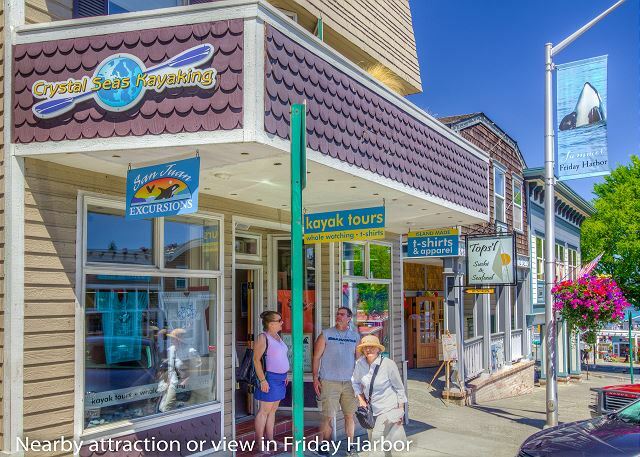 A quick short drive from Friday Harbor. The front porch and the adirondack chairs outside were also sweet. I would suggest if one has a car, to book this charming little cottage. well-kept and comfortable cottage, close to downtown yet far from the crowds and bustle of the mainland. quite charming (despite the common necessity that many vacation rentals are a bit antiseptic, this one included). much closer to the water than we were expecting, an unanticipated delight. Best Cottage a lovely place to stay. Ideal for 1-4. I rented the place thinking my daughter and granddaughter would be with me. When they could not make it my daughter-in-law and other grand-daughter could We loved the cottage immediately and the fabulous view. 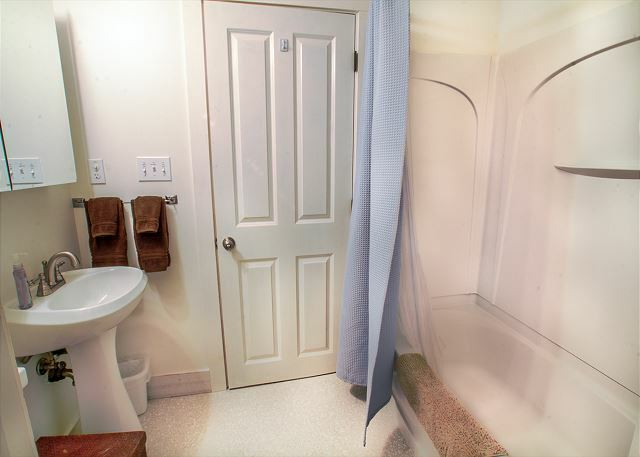 One suggestion I made to management was to install grab bars in the bath area. (I'm 75 and partially disabled).Also I had to miss 3 nights, sigh. Best Place Cottage is a great place to stay when visiting San Juan Island. The cottage is comfortable and very clean. 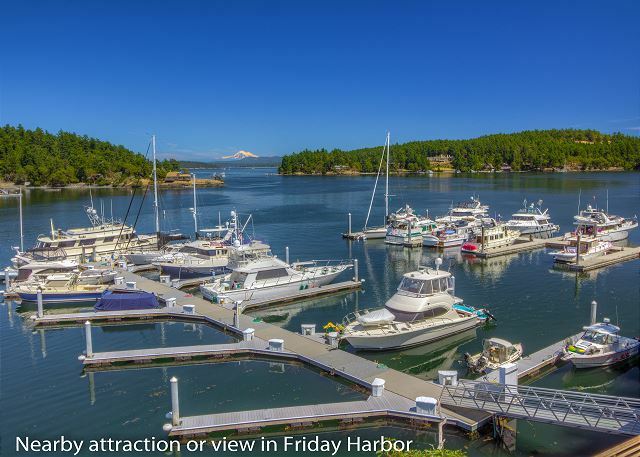 The location is perfect being just minutes from Friday Harbor. The view overlooking the harbor is nice and there is plenty of local wildlife to be seen. I have already recommended this cottage to friends. I was completely satisfied with the property. The cottage was everything we hoped it would be. 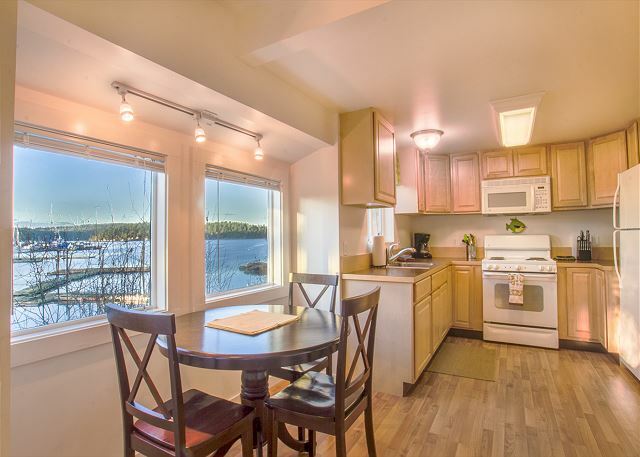 The view of the harbor, the seals, the cozy living room and nice kitchen all made for a wonderful stay. Even the the wavy floor was ok because it made us laugh. We had one day where it rained in the afternoon so we built a fire and did a jigsaw puzzle. Best of all, it was close to town so going out to eat was easy. We were sad to leave but have fond memories of our stay. Best Place Cottage was exactly what we were looking for. We will definitely be back and recommend this place to friends who want to visit the area. We enjoyed our stay at Best Place Cottage overlooking Shipyard Cove. Harbor Seals, Blue Heron and Belted Kingfishers greeted us on arrival. Nice walk to town. We thoroughly enjoyed our stay at Best Place Cottage. Great location. Very quiet. Very nice yard and views of the water and surrounding area. It was ready for us when we arrived - clean, lots of towels, good supply of kitchen items. The only slight negative is the furniture is very dated and well-worn. It didn't affect our stay or comfort, but kind of stood out of place for such a nice cottage. A wonderful cottage in a quiet location just a short distance from Friday Harbour. Wildlife all around as well as the delightful views out across the water to the islands. We absolutely loved our stay in Best Place Cottage! The location is perfect, close to town, but in it's own little marina. Sitting in the adirondack chairs, watching the neighborhood seals was so lovely. The cottage is very clean and comfortable, and actually quite roomy. We would definitely stay here again. Best Place Cottage - Wonderful! My fiancé, now husband, and I stayed at this quaint, little cottage when we went to San Juan Island to get married earlier this month. We stayed at the cottage for a week and could not have been more pleased with our lodging choice. We were able to watch the sun set and rise each day, watch sea animals play in the harbor and listen to the hummingbirds as they flew by. It was absolutely magical. I would recommend this cottage to anyone looking to stay on the island! The cabin was just outside of town and so quite and relaxing. Couldn't ask for a better view! Nicely appointed with comfy furniture and all the necessities. Can't wait to go back! My wife & I had a wonderful time at this property. The cottage was imaculate, roomy for the 2 of us, and very comfortable. 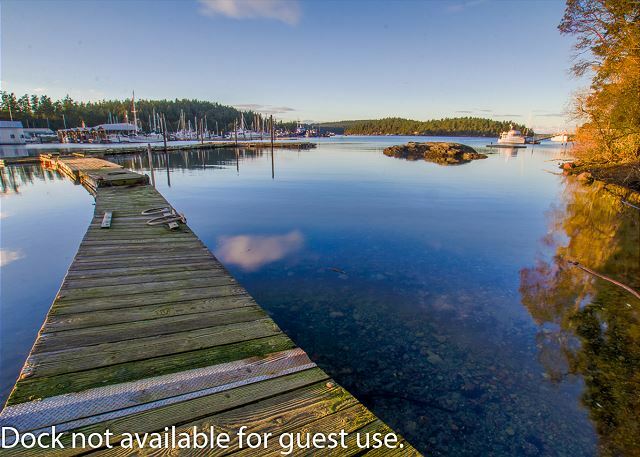 I only wished we could have used the dock and beach front as displayed in your marketing photos. We'll be back. A delightful cottage that is quiet, charming, with a wonderful view of the bay and harbor seals sleeping on the dock. We loved our stay at the cottage! Everything was so comfortable, clean and private. Loved watching the momma seal with her baby come up on the pier each evening! Close enough to everything yet away from the crowds. Great location, 20 minutes walk from town. Very quiet, great wildlife, lovely views. Very generously equipped. We loved it and would recommend it. The cabin couldn't have been more lovely. Cute and cozy inside snd out. Best Place Cottage is the Best! We loved our stay here. The view from the kitchen table each morning was amazing. We loved seeing the boats, the seals and the herons that would visit the little cove. The home had everything a small family would need. It was clean, comfortable and more spacious than we expected. Our two small children loved seeing the chickens in the backyard, too. We loved staying here. Thank you! Very comfortable cottage. It had all the conveniences of home. The bed was not lumpy, as someone had previously commented. The fireplace with real wood was a nice touch! we were sorry to leave such a sweet little cottage, and the little seals on the back pier! such a quiet place to hibernate after a full day of shopping, traveling, whale watching! we loved the fireplace, and the windows by the kitchen table. we were lucky to have spent a couple of days in Canada and were greeted by a group of orcas on the way home. We loved staying in the Best Place Cottage! It was so quiet and peaceful. I loved the early mornings on the deck with coffee watching momma harbor seal and her baby. The evenings were nice sitting out with a glass of wine watching the boats and seals. The cottage really was the best place for us. We liked being close to town but out in the quiet neighborhood on the water! Very comfortable, clean and had everything we wanted. The cottage seemed so far in the country and yet we were able to walk to town and church. Very interesting history of the Island discovered at the British & American Camps. Cottage was a delight, everything one would want was there. We had a wonderful time here! 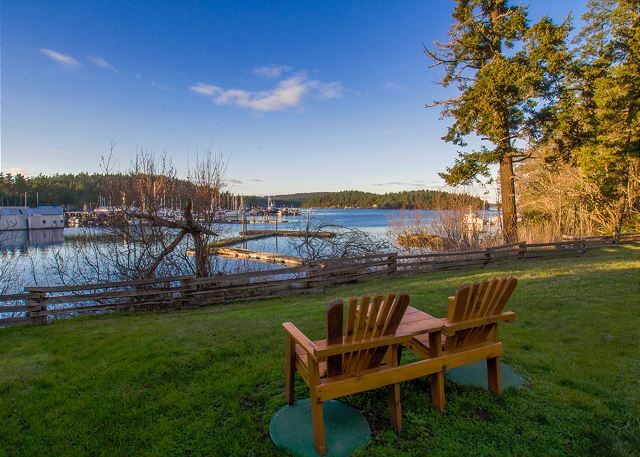 Location: excellent, 2 min drive out of Friday Harbor - convenient but peace and quiet at the same time. House: tastefully decorated, utensils and plates, etc. were of great modern standards. One downside is that the house only receives sun in the afternoons, which meant that it took awhile before it warmed up properly. Nature: there is a family of seals in the area, we watched them on the dock every evening. We also saw eagles out our window, one was drying his wings in the sun! Overall, great stay, would love to return. 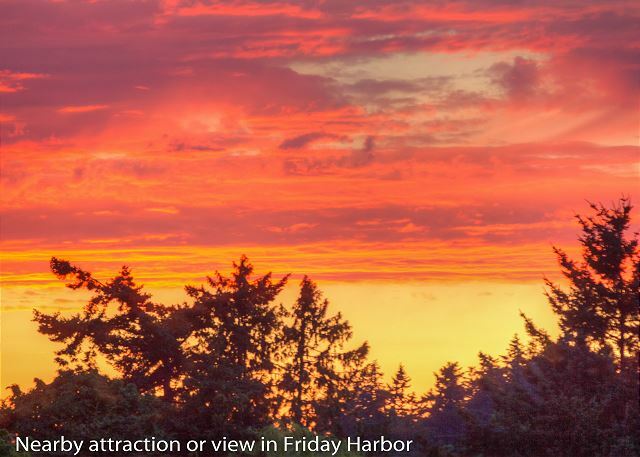 We were thrilled to have privacy, a view, and a comfortable place close to Friday Harbor. This property was exactly as described. Our only suggestion was to upgrade the mattress. We had the most relaxing and enjoyable week. It seemed that everything we needed was provided or thought of in advance. had a wonderful time. this certainly was the "best place"! we plan to come back. 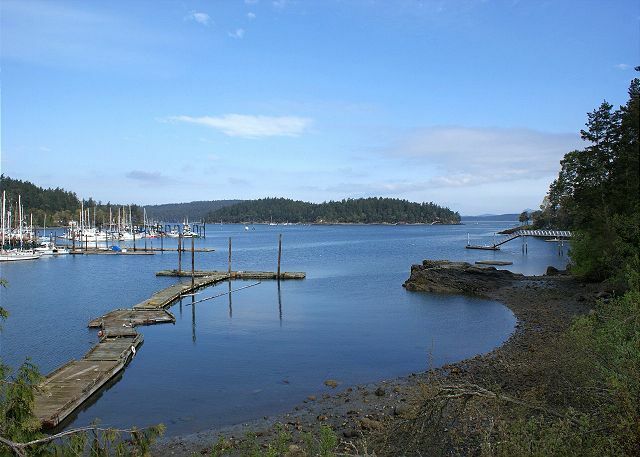 spotless house, great views, good books, very quiet and close to friday harbor. FANTASTIC! This was the perfect little property for our weekend away. Much better than a hotel room in that it had space for our little guy to crawl around and a separate room where we could put him to bed at night without having to spend the rest of the evening sitting in the dark, but comparable in price. The water view was great, with seals lounging on the dock. We definitely would recommend this place for a couple or small family. Amazing little cottage right on the water! Great place. Perfect for a week or weekend getaway. 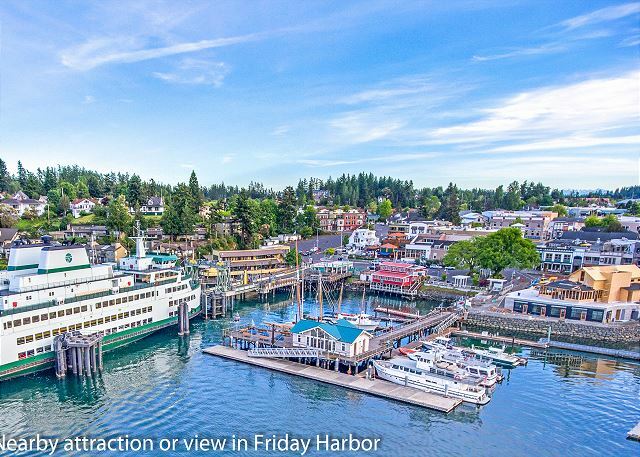 Far enough away from town to give a bit of privacy, but still close enough to all the action of Friday Harbor. Loads of wildlife right on the dock. A bummer the dock isn't accessible from the house. Make sure you have a car if you're staying here. The location was fantastic. The house was clean and ready for use. It was as described. I do prefer a firmer bed and that would be my only suggestion for improvement. The cottage is so charming in a perfect location. It's well furnished and comfortable. My only suggestion is to perhaps install an air conditioner. The weekend we arrived there was the hottest time of the year and it was so uncomfortable on the first night, we couldn't sleep well. It got really hot inside the cottage. The shower was a challenge to figure out how it worked but a return message from the management office the next day solved the problem. Another request is to upgrade the bed sheets to softer cotton sheets, including the mattress cover that feels like plastic. Overall, it's a lovely cottage and we'll definitely recommend it to friends. The Best Place Cottage was wonderful. The location, view and home are all great, could not have asked for better. There is a family of harbor seals that live right outside on the dock and a family of river otters visited most nights. The home was wonderfully equipped with everything you might need. We will be back! Excellent affordable little cottage by the sea. Would have been perfect with a BBQ that appeared should have been there(comment about cleaning it in the Cottage instructions) Great view.